When I started the South Beach Diet a few weeks ago, I had to rethink some of our meals, and less pasta was high on the list. It’s easy to get good fresh vegetables at this time of year, and we’ve kept the refrigerator stocked. 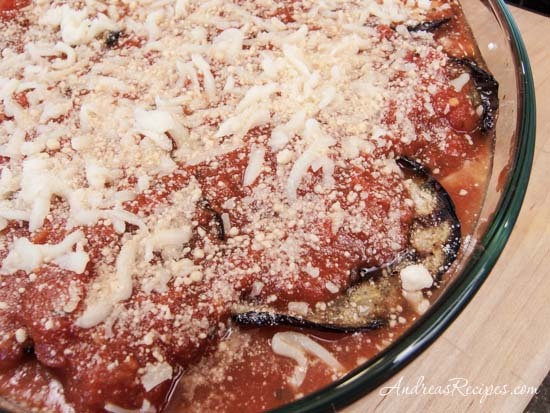 I’ve had eggplant lasagna on many occasions, but always with the noodles, so this time I decided to use the eggplant in place of the noodles, thus keeping the hearty comfort food a little healthier. Grilling the eggplant lends a nice smoky flavor to the lasagna, and I left the skin on to help hold the slices together on the grill. The sauce is our favorite spaghetti sauce from Michael’s mom, and the rest is just easy layering and baking. I made this on a weeknight after simmering the sauce all morning and afternoon, but you could also make this a weekend family meal or even for company in individual portions. 1. Prepare the sauce according to the directions. You can make this ahead and store in the refrigerator or freezer. If frozen, thaw before using. 2. Preheat the grill to medium, about 350° F/175° C.
3. Slice the eggplant into 1/4-inch (0.5 cm) rounds with the skin still on. Brush with olive oil. Grill for about 3 to 4 minutes per side. 4. Preheat the oven to 350° F/175° C.
5. In the medium mixing bowl, stir together the ricotta, egg, grated Parmesan, and dried basil. If using fresh basil, leave it out for now. 6. Spread a ladle or two of the prepared sauce in the bottom of the baking dish. Lay down a row of the grilled eggplant, then spread about 1/3 of the ricotta cheese mixture. It doesn’t have to look pretty, just make sure that it is evenly distributed, even if it’s in clumps. If using fresh basil, add 1/2 of the leaves in a layer. 7. Add about 2 more cups of sauce, then half the remaining grilled eggplant, 1/2 of the remaining cheese mixture, and the rest of the fresh basil (if using). 8. Add another 2 cups of the sauce, the rest of the grilled eggplant, and the rest of the ricotta cheese mixture. Spread the remaining sauce on top then top with the shredded mozzarella and some more Parmesan. 9. Bake uncovered in the preheated oven for 30 to 35 minutes, until the lasagna is cooked all the way through and the top is bubbly and golden brown. Remove from the oven and allow to sit for about 5 to 10 minutes before serving. I just saw Kalyn had done this. I think it’s a totally great idea and can’t understand why I haven’t seen or thought it before. Excellent Andrea! Oh my gosh, you weren’t kidding that we were channeling each other. I just love making lasagna like this, especially because it’s hard to make anything good with those big zucchinis. I have made it with eggplant too, and it’s fantastic. I assume I add the one egg to the ricotta mixture? Hi Todd. Thanks for catching the missing egg! Yes, the egg mixes in with the ricotta. I’ve corrected the instructions. I just made this and it’s delicious 🙂 An excellent way to use up the last of the eggplants! Wonderful Anna, I’m so glad you liked it! I just made this today, and it is wonderful! I’m following the Weight Watcher point system, so it’s always great to find recipes that offer lower fat cooking methods. Because I’m watching my calories and fat, I used olive oil cooking spray on the eggplant, substituted cottage cheese for the ricotta, and used reduced fat parmesan and mozzarella. I don’t think it took anything away from this dish. This looks amazing! I love Italian!